Hello, Monday! For this week's Runner Spotlight interview, we are hearing from a runner from my part of the country. You know, the cold part?! The Runner Spotlight came to be because I love to meet new people and, of course, talk running. Twice a month, a new runner will be featured on the Runner Spotlight. Through these interviews, we will meet and learn from runners of all distances, paces and food preferences. Meet Auralee. She is a wife, mom of two little boys and a passionate long distance runner. Her ability to balance family life and long distance training (plus running super fast) has been a great encouragement to me! Marathon training isn't for the faint of heart and, well, neither is motherhood. Being a mom of little ones and training for a marathon at the same time may sound like madness to some - but it's doable. And there is a rare breed that actually ENJOYS it! Let's hear from Auralee and how she gets it all done. When did you start running? What spurred your interest? I’ve been a runner for as long as I can remember, but my reason for running has changed as I’ve changed. I started running when I was six because I discovered that I could outrun every kid in my class (even the boys!). I started to take my running seriously when I was fourteen because I joined track and found out that I wasn’t the fastest anymore. Now as an adult and a mother of two, I’m still running–but not because of who I can outrun or who can outrun me, but because running offers me a form of strength and introspection that I can’t find anywhere else. When did you run your first race? What were your thoughts before/after? I ran my first race when I fourteen in the two mile for track. In the beginning of the race I took off with the much older and experienced runners without realizing that I wouldn't be able to maintain their pace. I faded in the second mile, but still continued to run as fast as I could. I learned an important lesson that I think we all sometimes forget - you don't win the race in the first few laps, it's at the finish. As I ran more races, I learned to stay relaxed and conserve as much energy until the closing mile or lap if I wanted to run strong. I enjoy running the marathon when my training has gone well and I'm having one of those rare days when my legs feel fresh and ready for a hard run. The euphoria of crossing the finish and achieving a goal time is a moment I love experiencing. I'm not coached by anyone, but I follow training plans from other runners and coaches such as Jack Daniel's Training Formula. I think every runner responds differently to training and what works best for them. I don't have lots of time to run several 20 + mile long runs. I will run one in the training, but that is all. Instead of focusing on the long run, I like to get two or one quality runs done a week at tempo or marathon pace. Usually these workouts don't exceed 16 miles. Along with quality runs, I think gradually increasing your mileage so you peak and taper at the correct time plays a key role in how you feel on race day. What has been your favorite race experience? Tell us a little about it! My favorite race experience was when I ran faster than my goal time of 3:15 in the marathon this year. 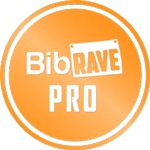 The previous year I spent months training for another marathon and ended up with a time I was very disappointed in considering all the time and effort I put into preparing for the event. I was looking for some redemption in running another marathon because I knew I hadn't ran to my full potential. I ran a much smarter race by running an even pace with the 3:15 pacer and then running a huge negative split for the second half. I felt amazing the last 10k when normally I'm hurting and slowing down. This race I ran in between 6:50 - 6:35 min miles and cruised to the finish strong. What is your favorite post-race treat? Food, drink, or other! I usually don't eat much junk food during my training and off season, but I do enjoy eating a serving of Moose Tracks ice cream. My parents never ran or had much interest in my sport, but they did provide for my endless supplies of running shoes and other clothing I would need to run. My siblings don't run much either, although they do share an interest in my running when I complete a race and how my experience went. Running helps me be a better parent, spouse, and friend. I am willing to take time out of my day for this important activity and make it a top priority. Sometimes I have to be creative and flexible when figuring out how to do my run, but it will almost always happen. I will run even if I'm running on empty after a sleepless night with a baby. I choose to run even though the dishes and laundry are overflowing. I run when it's below zero outside and my lungs feel like the inside of a freezer. I’ve dealt with my share of injuries, doubts and defeats; I don’t consider myself a naturally gifted runner–I have to work hard at it–and I have those days when I’m tempted to leave my running shoes unlaced. But then I remind myself that there is magic in misery. I imagine myself running–my shoes crunching against the snow, my legs gaining strength with each step, my breaths measured and deep. I know that if I don’t run, I am, as Karnazes has also said, denying myself an extraordinary trip. That is all I need to know. My shoes are on and I’m out the door, another stride into my running journey, and it feels like magic. I typically run in the morning after my oldest child leaves for school. I usually push my 2 year old in a stroller for base pace miles near my home. On days when I want to do speed work I go to a gym where they have daycare for my child. Then I run laps on a 200 meter indoor track or hop on a treadmill. What advice would you give to new runners and/or running parents trying to balance running and family life? Runners invest their heart and soul into training. They sacrifice sleep, suffer painful workouts, and spend countless hours day in and day out in uncomfortable weather conditions. These challenges are worth it when they achieve a new PR. But when that doesn't happen it's easy to become bitter and not want to run again. I think runners need to realize they can't run a PR every race even if they've prepared as best as they could. Unexpected illness, injury, side aches, muscle cramps, and other obstacles can occur outside of their control. It's normal to feel upset and disappointed, but don't let it defeat and derail you from getting back up trying again. Use failure to become a better athlete; implement different strategies to guide your training and never accept that you can't do it. Recognize that there will come a time when your body won't physically be capable of running a new PR. When this happens still strive to be the best version of yourself on the race course and in life. Put forth the same work ethic into achieving goals even when it will not be reflected by finishing times. Be proud of yourself when you know you did your best and that you will always get back up again even if you fail. 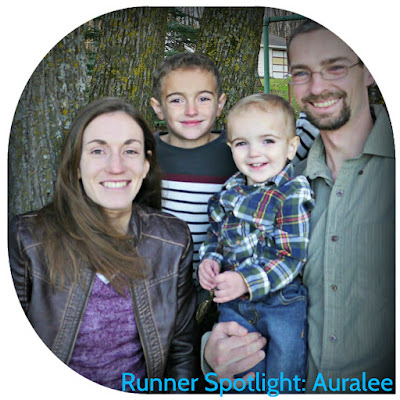 Thank you for taking the time to share your running experience and life balance insight, Auralee! I love these interviews, Amy. They allow us to get a big picture of how amazing women and mothers manage to realistically find balance. Thank you. And, love the Karno quote - his books are some of my faves. And, she is a speed one like whoa! Feeling better equipped to manage my life now actually. AWESOME. #fitfamlove #thefitdish Take care, friend! I know, isn't she an inspiration?! Other moms who get it done definitely motivate me. That marathon PR! Holy molly! I love love that you spotlight real women getting it done. She has one ridiculously awesome PR!